Although olive oil is the predominant oil used in households around the world, it is not always the best choice for cooking. Olive oil does not lend itself well for higher temperature cooking. In fact when it’s heated above 350 °F (177 °C), the unrefined particles within the oil get burned. This leads to deteriorated taste and even toxicity. Olive oil, especially extra virgin, is an industry standard for a good fat choice, but alternative varieties such as Grape seed, avocado, nut, coconut and even pumpkinseed oil, are also being touted for their health properties. However, there are several fabulous alternative oils available. Alternative oils offer benefits ranging from high antioxidant levels, cholesterol-lowering properties, ample vitamins and omega-3 and/or omega-6 essential fatty acids, which help decrease inflammatory conditions such as heart disease among other substantial benefits. Here are some other choices that we like to use in our dishes in order of our favorites. You’ll find our favorite oils and where to find them in the main Eat For Life page. Coconut oil: Coconut oil is very heat stable so it makes an excellent cooking and frying oil. It has a smoke point of about 360°F (180°C). Because of its stability it is slow to oxidize and thus resistant to rancidity, lasting up to two years due to high saturated fat content. Grape seed oil: High in antioxidants, possesses cholesterol-lowering properties and has a 485 degree F. smoke point. almost twice that of olive oil. The high smoke point ensures that no negative flavors will be introduced to foods when searing or sautéing. Olive Oil: There are different ones. The lighter the oil the better it will be for sautéing and cooking. The thicker and darker, the better for salads and dipping. 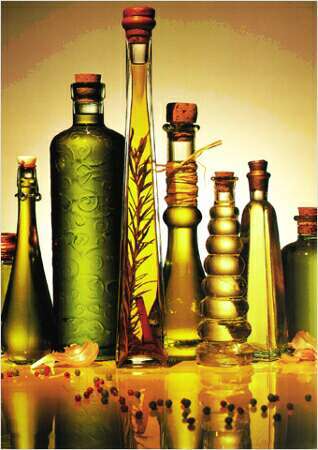 Sesame oil: Light sesame oil has a high smoke point, and is suitable for deep-frying, while heavy (dark) sesame oil (from roasted sesame seeds) has a slightly lower smoke point is unsuitable for deep-frying, instead it can be used for stir-frying of meats or vegetables; making of omelets. Most in Asia used Roasted Sesame Oil for seasoning, particularly in East Asian cuisine. Avocado oil: It has a 500 degree F. smoke point and is high in monounsaturated fat, which raises the level of HDL, the good cholesterol and lowers LDL, the bad cholesterol. Tea seed oil: (be careful not to confuse it with the inedible Tea tree oil): It is cold-pressed, and is also known as camellia oil. It has a high smoke point of 485 degrees F., and has excellent storage qualities. Tea seed oil is used in salad dressings, dips, marinades and sauces, for sautéing, stir frying and frying. For a non-oil, but extremely heat stable, take a look at Ghee. It’s truly fabulous. Pumpkin seed oil: This is one of our favorite finishing oils. It comes from one of the nine regions of Austria called Steiermark and has been called green gold. This oil goes a long way – one tbsp is ample for a big bowl of salad. The oil is high in zinc, vitamins A, B, C, D, E and Omega-3s and Omega-6s. It is most delicious on salads, condiments, ice cream and other deserts. (Note: if you get this oil on your clothes, DO NOT wash or spot treat the stain, just take the fabric and lay it out in the sun and the spot will disappear. If you don’t do that, you will never get rid of the stain). Hazelnut oil: It is lighter and fruitier, as well as higher in monounsaturated fat than walnut oil. It is excellent drizzled on grilled fish or salads. Walnut oil: It is rich in Omega-3s. It is not used for high-heat cooking, and it is a popular component for salad dressings and to add a nutty flavor to a finished dish. Best if used sparingly. Pistachio oil: It is usually more expensive than other nut oils, has an intense nut flavor and a distinct emerald green color. Pistachio oil is high in Vitamin E and is used as table oil only. Do you eat Hemp seed oil at all? We enjoy it daily and it has many positive health benefits. Seed oils in general are higher in Omega 6 fats which are pro-inflammatory. Hemp seed is better than most with a ratio of 3:1. We recommend and aim for a ratio closer to 1:1. That is equal amounts of Omega 6 and Omega 3.